This luscious Amethyst gemstone is one of the most beloved gemstone because of its majestic deep purple color. 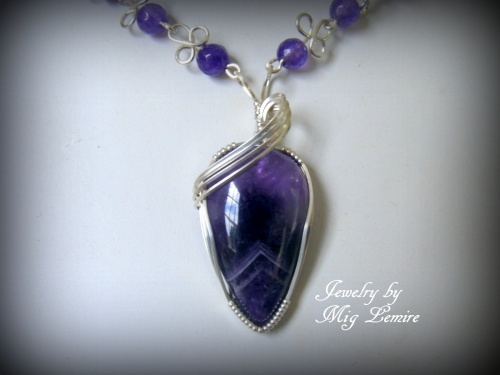 This gemstone's focal is framed and designed with a beautiful argentium silver scrollwork - argentium doesn't tarnish as easily but has the same silver content - and the piece is accented with beads that are amethyst gemstones as well. Amethyst is said to be an extremely powerful and protective stone. A natural tranquilizer, it is suppose to block stress and negative environment energies. We all need that. Piece comes with complimentary earrings also in sterling silver. Measures 18" long.